If you have missing tooth or a space between teeth a dental bridge may be a great solution. 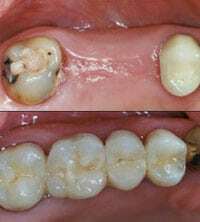 A dental bridge uses the two teeth on the opposing side of the space as anchors to attach a natural looking custom porcelain tooth to fill the space. If you are missing a lot of teeth we can use dental implants to support the bridge as well. Our doctors in Hillsborough New Jersey have used dental bridges to help many patients replace missing teeth for decades. How is a dental bridge made? During the second visit the doctor will cement the bridge in place, make any minor adjustments if required and you are all done!